Here’s something you might not guess just by looking at the photos: Hotel La Semilla owners Alexis Schärer and Angie Rodriguez met while cutting their teeth at the Plaza Athénée, one of Paris’s most opulent hotels. 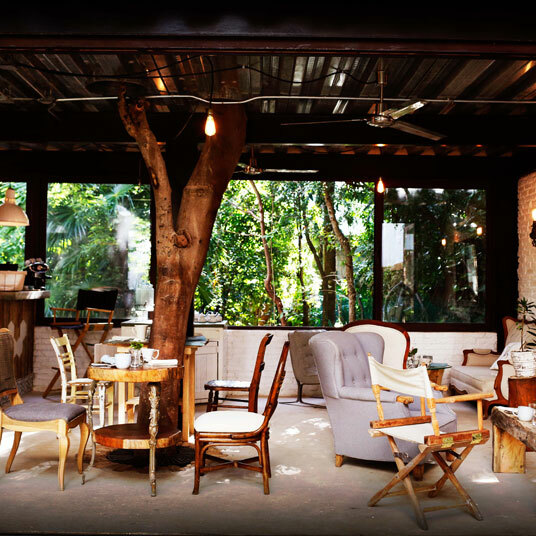 Needless to say, the charms of their nine-room Playa del Carmen b&b, a mishmash of cozy public nooks and quirky little rooms furnished with Mexican flea-market finds, are somewhat more down to earth. Even if you couldn’t care less about all that, you’ll still be inhabiting a world of thoughtful little pleasures. The rooms are small (all but the Suite Terraza are around 200 square feet), but they’re also full of clever touches — a bedside table whose drawers are well-worn leather suitcases, an antique chandelier with an Edison bulb where the candle once would have gone. At the top end of the scale you get a king bed and an outdoor bathtub or shower amidst the foliage, but at every level character reigns supreme.